people with names like mine. I was born here. I didn’t have to adopt America, but I adapted to it. Swift on the heels of an “honest language,” we find an “honorable death.” Hope for the former must answer to the common lie of the latter. Too often the adjective “honorable” is cheap compensation for needless death in needless war; too often an “honest language” would only speak directly the racism the mayor confines to a glance. With compassionate precision, Charara sets these phrases alongside one another, and we remember their shared root, how in English “honesty” begins not in truth but in honor. 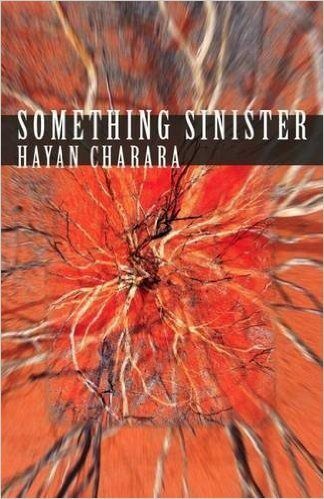 Something Sinister works to restore honor to a language ruptured by the violence of the “war on terror” and the rhetoric aptly named “truthiness.” Charara accomplishes this through an ethics of closeness that preserves difference, an ethics suggested even in the small gesture above, “honest” and “honorable” echoing and challenging one another. What honesty can speak power to truthiness? Elsewhere in “Usage” Charara writes: “I spoke English with my father, he replied in Arabic. / Then I wondered, who’s to decide whose language it is / anyway—you, me?” Answers arrive not in the vocabulary of linguistic theory or workaday politics but in “the radio / interrupting the clamor of cicadas / with rumors of a truce // and the murders preceding it” (“The Trees”). The urgency and complexity of this question (“you, me?”) are made apparent in the book’s opening poem, “Being Muslim.” The title would seem to embrace the role of speaking on behalf of a collective identity, a role that contemporary politics thrusts upon someone who is, for example, a Muslim and Arab and American in the age of the “forever wars” or the “war on terror,” terms that have served to mask the racism of the violence they name. Yet having assumed the mantle of collective identity, the poem offers the personal, the intimately known: the poet’s father, who “worshipped” Muhammad Ali, who “loved being Muslim then. / Even when you drank whiskey. // Even when you knocked down / my mother again and again.” In the final stanzas, Charara evokes suras of the Qur’an (“Ta’ Ha’, Ya Sin, Sad, Qaf”) whose titular letters signify only themselves, their meanings lost or yet to arrive, and concludes, “God of my father, listen: / He prayed, he prayed, five times a day, // and he was mean.” This “and” refuses to reduce the father’s violence to a parable of hypocrisy; no single explanation may salvage it (as the book will address movingly when it considers the father’s entry into psychiatric discourse and medication). The external demands of identity (“Being Muslim”) neither cancel nor fulfill the scope and specificity of the personal (“O father bringing home crates / of apples, bushels of corn, and skinned rabbits on ice”). The poem “Being Muslim” refuses to yield the signification its title seems to promise; it calls up and out from (“O prayer”) the irreducible sensuousness and suffering of one life. We are getting close, at least. Red birds flash past my window. I can’t help but think of fire. In this plain-spoken final line, we hear how close each noun is to (becoming) another; how easily the verb “love” may mean “kill.” “Now I have become you, and you me,” Charara says, a pronouncement that enacts both great compassion and real fear. The longer those men keep chanting, the longer the poet may be mistaken for them, and the less any distinctions will matter in the threatening conflagration. “You are making it impossible for me to live,” the poet says, with a note of patience, and in this line the “I”s and “you”s are, as ever, multiple. The careful use of articles in the poem’s final line testifies similarly: “a fire speaks to a tree.” The indefinite article resists polemic and insists on the immediacy of experience over the betrayal of meaning-making. “The fire” would be a historical event around which subjectivities and politics would stabilize; “a fire” is still anyone’s, could approach any of us, from here or there. Hilary Plum is the author of the work of nonfiction Watchfires (Rescue Press, 2016) and the novel They Dragged Them Through the Streets (FC2, 2013). Recent criticism has appeared in Full Stop, Bookforum, Music & Literature, and elsewhere. She lives in Philadelphia.